As recently seen in the Official Nintendo Magazine, Nintendo revealed six of their Augmented Reality Cards. One of these cards was shown in the features trailer for the 3DS, and can be seen in video below at the 1:50 mark. 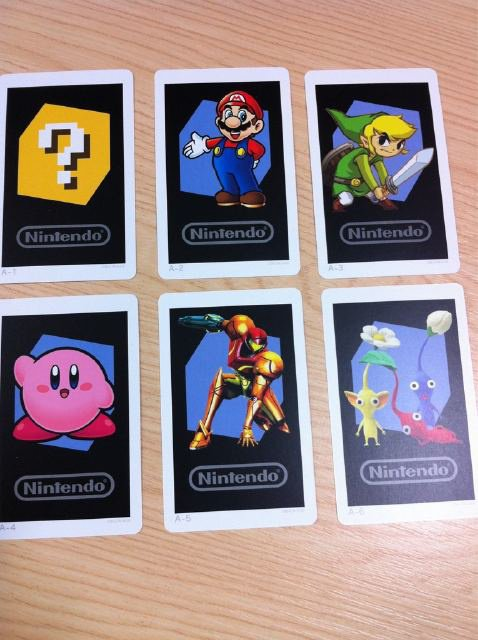 All six cards seen below come with every 3DS and all of them are Nintendo favorites. The card we’re interested in is the Link card of course, but no one is really sure what to expect. In the video below, a creature is seen moving around attacking the 3DS, but can we expect something similar with Link? Will we help him fight off some octorocks? Perhaps these character cards will just be 3D statues that seem to sit on the table in front of us. I think that these cards will be a nice added feature to the system. As the trailer shows it could be anything from a neat little game or figurine replacement to a whole culture of trading cards. I look forward to getting my hands of some of these to see what they’re all about. While there is some impressive technology going on with this feature, the simplicity of it is what I find truly impressive. Just pointing the camera at the card is enough to initiate an epic battle with a dragon! Just watch the video to see what I mean. And who knows what adventure we could get into with Link, Mario and Samus. What are your thoughts on the augmented reality cards? What do you hope to see them do? Do you want simple figurines that you can explore by moving around them? Or a moving changing action scene set against the backdrop of your kitchen table, or your desk at school? Let us know in the comments.